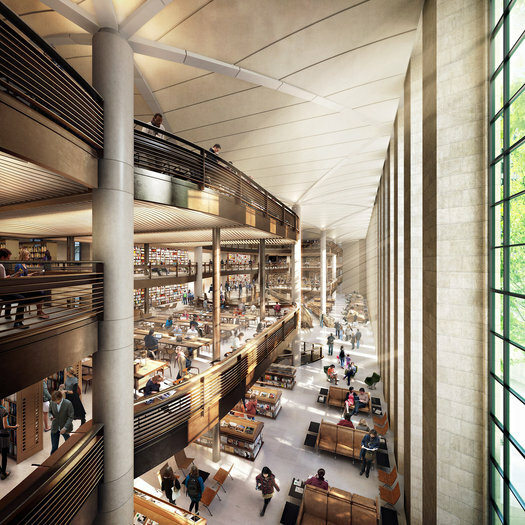 Renderings of Norman Foster’s proposed renovations of the renovated New York Public Library. Just as the New York Public Library released plans for their renovation of the grand 1911 Carrère and Hastings building, we wrapped up another semester of my Archives, Libraries & Databases class. We started off the semester by historicizing “information overload” and the compulsion to collect, sort, organize, delete, etc. Then, to “ground” the archive theory we were about to explore, we began our Archives unit with a guided tour of the New York City Municipal Archives. We read some Michel Foucault, Wolfgang Ernst, Terry Cook, Ann Stoler, and Diana Taylor. And after that, we explored archival aesthetics by examining a selection of artists who either make use of archival materials in their work, or take the archive-as-institution as their inspiration. After that, we considered different theories and strategies of classification. And then to introduce our Libraries unit, we took a guided tour of the Morgan Library and visited the Reanimation Library, where we explored the collection and brainstormed possible means of classifying images without privileging their subject matter. What if we classified images not by what’s depicted in them, but according to other properties — color, form, density of information, etc,? We then looked at more idiosyncratic libraries, particularly the Warburg and Prelinger libraries. To round out this unit, we considered the future of the library, then met with our University Librarian and Archivist to talk about practical considerations in planning for that future. We then moved on to databases, reading some more Foucault and exploring the prescient work of Paul Otlet and Vannevar Bush. Then we talked about the “episteme” of the database, considering how data is transformed into information, and perhaps knowledge and wisdom. We looked the database-building work of Alan Liu and Lev Manovich. And while I was in Sweden, we brought in Rory Solomon and Ted Byfield to talk about database aesthetics. As an appropriate close to the semester, we visited the Ann Hamilton installation at the Park Avenue Armory. And then in our last class everyone presented their projects (I had a smaller group this semester; thanks primarily to the economy, the student body was smaller across the board in my program and throughout the university). Andrea explored connections between Aby Warbug’s Mnemosyne Atlas and the work of Gaston Bachelard; both are concerned with templates/floorplans, pathways, intervals, etc. — Bachelard in space, Warburg within and between the panels of his Atlas. Andrea then designed her own panels, featuring representations of “gesture,” “fire,” and “memory,” as proposed additions to the Atlas. Angelica focused on objects that are typically extracted from the archive — specifically, technologies of “attachment,” like paperclips, rubber bands, brads, etc. These fasteners do important intellectual work in organizing papers into conceptual units, yet they have deleterious material effects on archival documents. She wanted to collect these un-collected tools of collection! Chris began to explore archives of historical computer manuals in an attempt to determine how these documents construct habits of computer use, frame the relationship between human and machine, and even embody affect. The Venue book for data collection, via Venue. Lara investigated possibilities for bringing collaborative knowledge-making — as exemplified in projects like the Public Laboratory and BLDG BLOG / Edible Geography’s Venue — into the public library. Oz examined the challenges of archiving performance art, focusing specifically on the work of Marina Abramović, whose proposed Marina Abramović Institute will espouse a particular philosophy of recording, preserving, and granting access to performance. Steve examined the archival turn in filmmaking, focusing specifically on the construction of alternative histories of British coal mining. He studied the National Coal Board’s films of 40s, 50s, and 60s, and Bill Morrison’s The Miner’s Hymns and, then drew connections to Jeremy Deller’s The Battle of Orgreave. Sieves (01) from Shawn Greenlee on Vimeo. Finally, Willy used Spectral Audio Processing to propose a sort of “machine reading” of — or listening to — music, as a sonic variant on Lev Manovich’s Cultural Analytics.